I hope you had a good holiday season, and I wish you a happy new year. 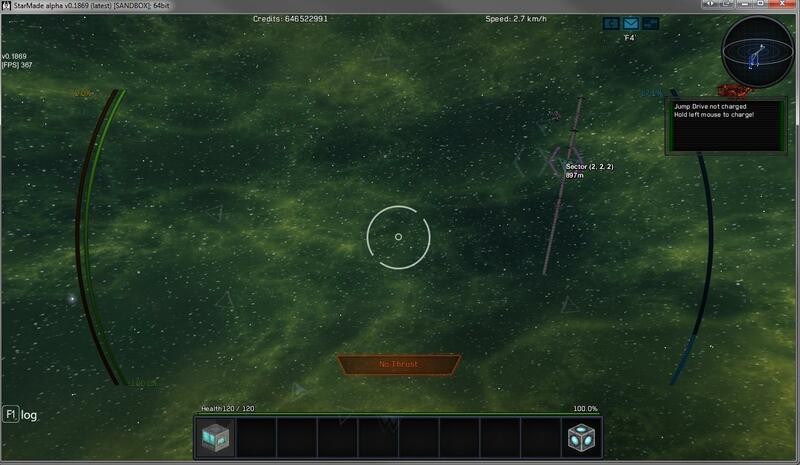 While things in the last week were a little slow, the new GUI is well on the way. 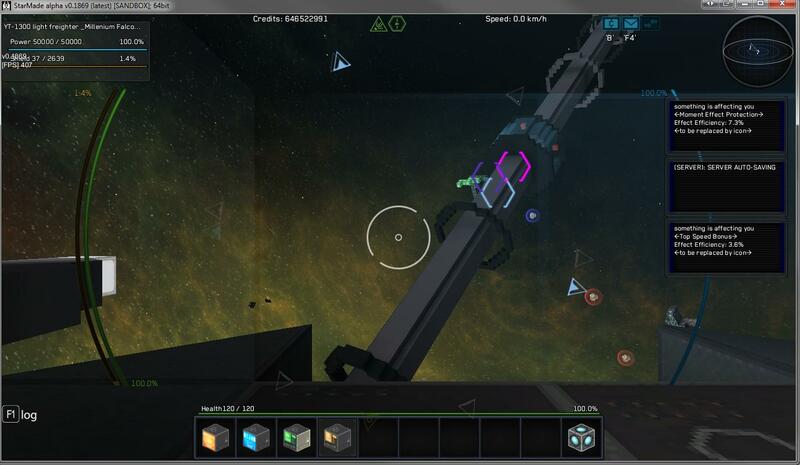 Here are a few WiP pictures of the new HUD. As you can see, bars (power/shield/etc) have been moved to the sides. Please note that this is not in any way finished. this is just a snapshot and will probably look a lot different in the actual update. They will only be visible if needed of course. Every element is now much more in line with an overall design. Credits, and speed display are of course not done yet. A lot of more elements are also still to come for the HUD. Shop and Mail has been put into icons (third one will be for player trading). You can also see that the mini map has been overhauled to be much more usable. There will also be a bigger version available. The messages on the side will be gone for the active effects, and a lot of status messages (also the big ones "Flight Mode" etc will be made much less intrusive). Here you can see the icons for defensive effects of overdrive and explosive. Also I forgot to mention the indicator change. All of the rest of the GUI are also on the way to be redesigned. 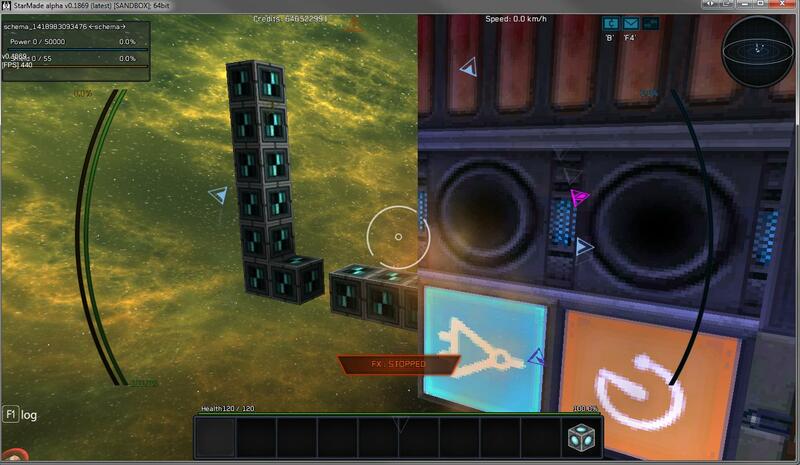 All the GUI elements will also find their way into a config file for easy modding. We will also include a color palette for color blindness. I hope you like what you see. As said, this is just a snapshot and a lot more will come. I'm now working again in full force. There may be some little updates coming until the new GUI to address some bugs, as well as optimization. Thanks to all the server admins who agree to let us take performance data, as that is the data which is impossible to get otherwise (performance data of 40+ people playing). I already identified a ton of areas to improve. Especially the ping problems when a lot of players are on will be addressed and hopefully solved soon. Sinon le dernier paragraphe est pas mal interessant je trouve aussi. The post was edited 1 time, last by Vidic ( Jan 6th 2015, 2:59pm ).